We endeavor to make wine making simple and offer flexible scheduling. At Grapes N’ Barrels making your own private label premium wine is neither complex nor time nor labor intensive. Based on your varietal (wine) choice and your schedule, our winemaking sessions can be as flexible as you would like them to be. Bottom line: If you have an interest and desire in making your own private label wines, Grapes N’ Barrels makes it easy for you. At Grapes N’ Barrels you can make your wine any time of the year. Minimal time is required. Sessions are based on your schedule. You can be as ‘hands-on’ as you want to. Create your own private label wine in 4-5 hours of hands-on winemaking. While the Four-Session process highlights participant hands-on activities, winemaking involves careful fermentation steps and frequent monitoring which is handled by the Grapes N’ Barrels Staff. Thus, your time-line for producing a premium wine spans the time required for proper wine aging. 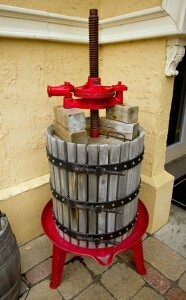 See Grapes N’ Barrels Winemaking Methodology. Winemaking is fun and we want your session(s) to be anxiously anticipated!